nce upon a time, at Point Pleasant, a small town on the Ohio River, there lived a young couple who could not decide how to name their first baby. He was a darling child, and as the weeks went by, and he grew prettier every minute, it was harder and harder to think of a name good enough for him. He found, when he reached the school, that his name had been changed. Up to this time his initials had spelled HUG, but the senator who sent young Grant's appointment papers to Washington had forgotten Ulysses' middle name. He wrote his full name as Ulysses Simpson Grant, and as it would make much trouble to have it changed at Congress, Ulysses let it stand that way. So instead of being called H-U-G Grant (as he had been by his mates at home) the West Point boys, to tease him, caught up the new initials and shouted "Uncle Sam" Grant, or "United States" Grant--and sometimes "Useless" Grant. He stormed right through the enemies' lines and took fort after fort. Oh, his work was splendid--this man who had been called a failure! You see, the war kept raging harder and harder. It seemed as if it would never end. Grant was always at the front of his troops, watching everything the enemy did and planned, but he grew sadder and sadder. He felt sure there would be fighting until dear, brave Robert E. Lee, the southern general, laid down his sword. The whole country was sad and anxious. They said: "It is time there was a change--what in the world is Grant going to do?" And he answered: "I am going to fight it out on this line if it takes all summer!" No one doubted he would keep his word. It did take all summer and all winter, too. Then, when poor General Lee saw that his men were completely trapped, and that they would starve if he did not give in, he yielded. 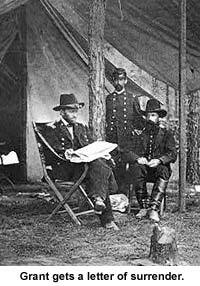 Grant showed how much of a gentleman he was by his treatment of the general and soldiers he had conquered. There was no lack of courtesy toward them, I can tell you. When the cruel war was ended, Grant was the nation's hero. Later, Grant was made President of the United States he had saved. When he had finished his term of four years, he was chosen for President again. After that he traveled round the world. I cannot begin to tell you the number of presents he received or describe one half the honors which were paid him--paid to this man who, at one time, could not get a day's work in St. Louis. This farmer from Hardscrabble dined with kings and queens, talked with the Pope of Rome, called on the Czar of Russia, visited the Mikado of Japan in his royal palace, and was given four beautiful homes of his own by rich Americans. One house was in Galena, one in Philadelphia, one in Washington, and another in New York. New York was his favorite city, and in a square named for him you can see a statue showing General Grant on his pet horse, in army uniform. On Claremont Heights where it can be seen from the city, the harbor, and the Hudson River, stands a magnificent tomb, the resting-place of the great hero who was born in the tiny house at Point Pleasant. There was always a good deal of fighting blood in the Grants. The sixth or seventh great-grandfather of Ulysses, Matthew Grant, came to Massachusetts in 1630, almost three hundred years ago; over in Scotland, where he was born, he belonged to the clan whose motto was "Stand Fast." I think that old Scotchman and all the other ancestors would agree with us that the boy from Ohio stood fast. And how well the name suited him which his aunt drew from the old silk hat--Ulysses--a brave soldier of the olden time!